A carte-de-visite sized card with two round albumen prints promoting (on the reverse) the Egyptian establishment of Leop. 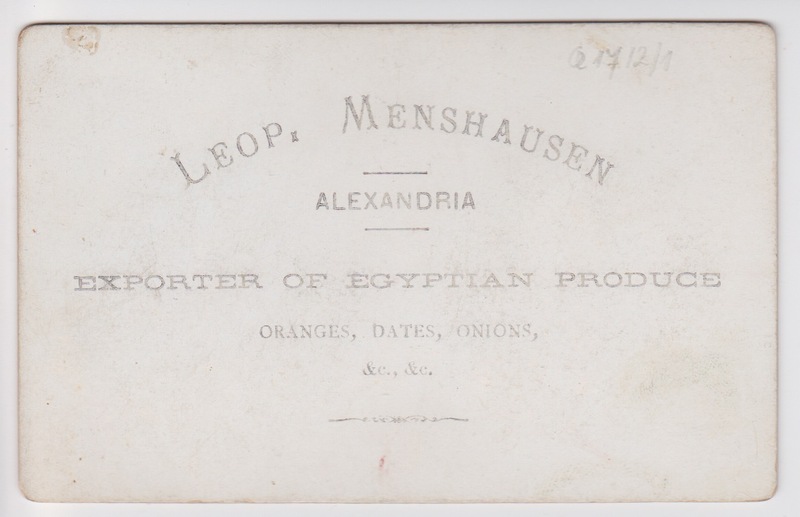 Menshausen of Alexandria, producer of Egyptian Produce: Oranges, Dates, Onions, etc. 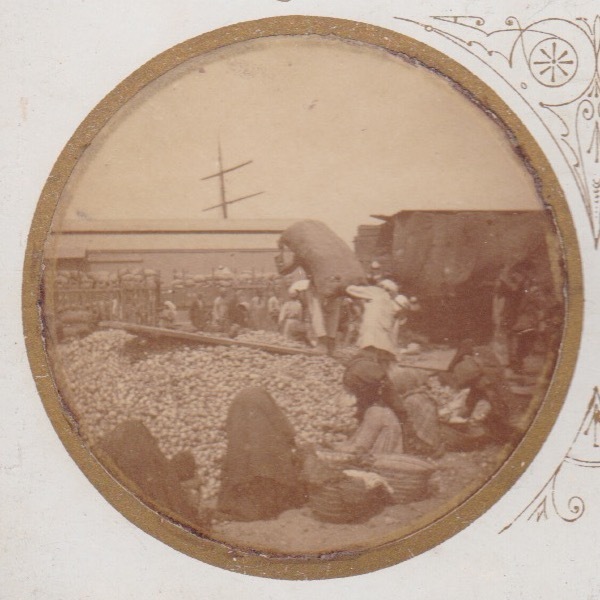 The first image showing porters carrying sacks with – I presume – this produce; the second image showing unidentified houses. The front of the card with the text “Aufnahmen mit C.P. 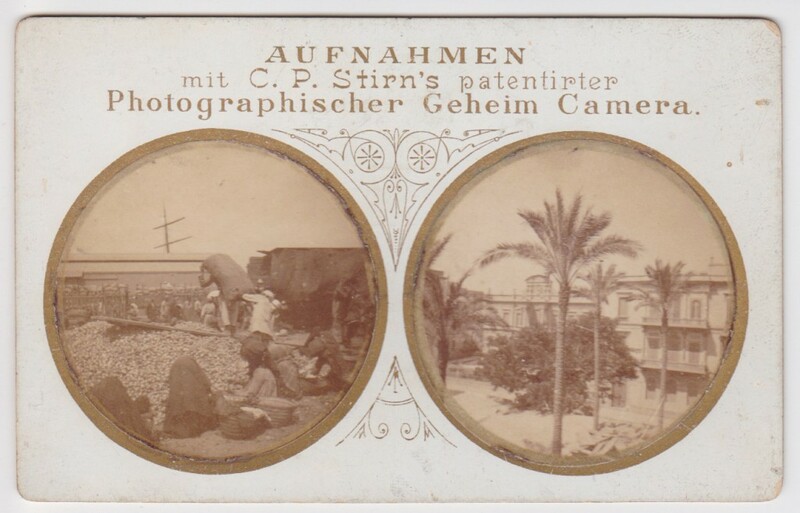 Stirn’s patentirter Photographischer Geheim Camera”. The website of the National Media Museum in Bradford, UK contains an interesting article by Colin Harding about this famous “hidden” camera. “However, the introduction of far more light-sensitive, commercially manufactured gelatine dry plates in the late 1870s made ‘instantaneous’ exposures fully practical for the first time. During the 1880s, cameras designed to be used whilst hand-held became increasingly popular. In 1881, Thomas Bolas took out a British patent for a box-form plate camera. Because it could be used in the hand, inconspicuously, he coined the name ‘detective camera’ for his invention. The term came to be applied to almost all hand cameras that appeared up to the end of the century. Most detective cameras were simple wooden boxes, sometimes covered in leather or even brown paper so as to resemble bags or parcels. Some, however, took things a stage further. During the 1880s several designs for disguised cameras appeared, designed to resemble books or watches or to be hidden in ties, hats or walking sticks. Some detective cameras relied on concealment rather than disguise. The best-known of these concealed cameras is Stirn’s waistcoat camera – invented by an American but turned into a commercial success by a German. In December 1885, Robert Gray demonstrated a new camera of his own invention at a meeting of the New York Society of Amateur Photographers. Gray’s ingenious camera was designed “to be carried concealed upon the person” and incorporated, as an integral part, a half-waistcoat or ‘vest’ – just like a false ‘dicky’ front worn for evening dress. The camera was hidden behind the waistcoat front with the lens poking through, disguised as a button. In 1886, after some minor modifications, Gray’s camera was manufactured in America by the Western Electric Company and sold by the Scovill Manufacturing Company. Realising the, as yet untapped, commercial possibilities of the camera, Carl Stirn of New York entered into negotiations to buy the patent rights from Gray. A suitable deal was struck and in July 1886 Stirn was granted a German patent. Carl’s brother, Rudolf, owned a camera factory in Berlin and by the end of the year had begun production of what was now officially known as ‘CP Stirn’s Patent Concealed Vest Camera’. Disc shaped and all metal in construction, at first glance the camera resembles a cross between a frisbee and a hip flask. Thin enough to be worn unobtrusively beneath an ordinary waistcoat, it hung from the photographer’s neck on a strap. The f10, fixed-aperture lens poked through a buttonhole of the waistcoat and, as a further aid to concealment, was designed to look like a button. Exposures were made on a circular glass plate that was rotated after each exposure by turning a knob protruding from the front of the camera. Six photographs, 40mm in diameter, could be taken on each plate. Rotating the knob also set the rotary shutter, which was released by pulling on a length of string which dangled from the bottom the camera. Considering its unusual design, the camera was surprisingly popular. By 1890, the manufacturers claimed that no fewer than 18,000 had been sold. Despite its novelty value, contemporary reviewers noted that it was capable of producing quite acceptable results.